Don't get me wrong. 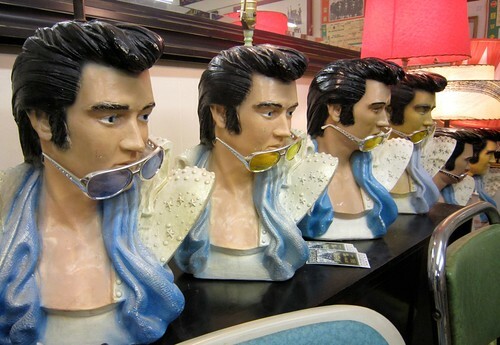 I'm an Elvis fan; a big fan, even though I'm not one of those people who make pilgrimages to Elvis's old stomping grounds at Graceland, or have an Elvis shrine in the bedroom. 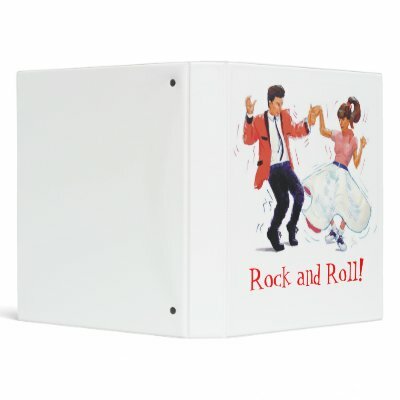 I love his movies (my fav is Jailhouse Rock), and there's nothing I enjoy more than crooning "Love Me Tender" or belting out "It's Now or Never" in the shower. 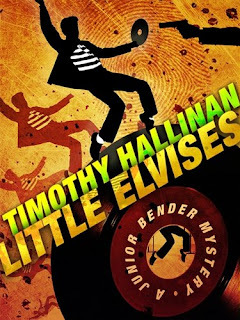 So when I spied a book titled Little Elvises by one of my go-to authors, Timothy Hallinan, I was on it like a flea on a hound dog. When the book begins, Los Angeles cop Paul DiGaudio is in an interrogation room stuffing his face with Halloween-size Tootsie Rolls, while he tells crook/narrator Junior Bender he knows Junior didn't commit the Hammer job. That job was a robbery in which the elderly Mrs. Hammer was pistol-whipped. Junior has an alibi and, besides, he's smart enough not to pack a weapon when he burgles, so he can avoid a robbery-under-special-circumstances charge. Junior's innocence doesn't matter to Paulie. Paulie is aware that Junior is a crimebuster for people "on the other side of the fence." (If you don't already know this, you can read Georgette Spelvin's review of the first Junior Bender book, Crashed, here.) Paulie's Uncle Vinnie is a suspect in the killing of Derek Bigelow, the kind of journalist who writes for The National Snoop, and Paulie is going to force Junior to help Vincent L. DiGaudio prove his innocence. We've all noticed how American pop culture makes copies of anything original that makes money. Rina, Junior's 13-year-old daughter, wrote a school paper focusing on Philadelphia's Little Elvises, "who were churned to the surface in the wake of Elvis Presley." A few of them, such as Bobby Angel, could sing. None were as hard on the ears as Giorgio, yet he was so beautiful he was popular up until his disappearance in 1963. The man behind all the copycat singers with pompadours and tight pants who appeared on American Dance Hall and sold many records for a month was Paulie's Uncle Vinnie. This isn't good for Junior. The job Paulie wants him to do not only involves murder, it may involve the Mob. Reading about crime is well and good, but when vivid writing makes laughs snort out of your nose, that's even better. It's one of the reasons I like Timothy Hallinan. Let's put Uncle Vinnie on the back burner while I show you Marge 'n' Ed's North Pole, a seedy motel at the north end of North Hollywood. Junior is divorced and he moves around a lot to thwart fellow criminals with a beef against him. This month's motel is a fantastic pick because no one would think Junior could sink so low. It's always Christmas at the North Pole and Junior is in Blitzen, where the cord to the blinkie-lights is glued to the outlet and "for good elves only" is engraved on the table. The carpet had been "a snowy white fifteen or twenty years ago, but was now the precise color of guilt, a brownish gray like a dusty spiderweb, interrupted here and there by horrific blotches of darkness, as though aliens with pitch in their veins had bled out on it." There is no more 'n' Ed but there is a Marge, who has a cigarette screwed into a corner of her mouth and an economy-size jug of Old Igor's Private Stock vodka glued to one of her hands. She is smart enough to recognize that Junior, while not checking into the North Pole with a body in the trunk of his car, is not entirely law abiding. He's a mensch who might be able to find her daughter Doris. Marge hasn't heard from Doris in a few weeks, and what she saw when she stopped by the rented dump where Doris had been living with Mr. Pinkie Ring scared her. Junior now has two detective job offers he can't refuse and he sets to work. Assisting him are his precocious daughter, Rina, Paulie and criminal pal Louie the Lost. They and the characters at the opposite end of the magnifying glass are so colorful they could stock a box of human Crayolas. For example, there's Popsie, the woman who answers Vinnie's door, with calves so muscled they look like "they'd evolved to hold the planet still while she walked." Vinnie's hair is dyed "a dead black that ate light without reflecting any" and he has a little soul patch that "clung uncertainly to his lower lip, like a misplaced comma." There's a neighbor who's "eighty, eighty-five, and so wrinkled it looked like he had enough skin for three people" and his hair is as "white as processed flour." There are people trying to stop Junior's investigation and a hired killer is so unusual and brilliantly drawn my stomach trembled. Somewhere in between Junior's friends, enemies and suspects is Bigelow's non-grieving widow Ronnie, who has lapis blue eyes and baby-fine blond hair twisted into a rope and held in place on top of her head by an inserted fork. She has a thing for bad men. At its heart, Little Elvises isn't a purely comic novel, even though there are many funny touches and scenes that made me laugh. It's full of characters wounded by loss and bad luck. Musicians make music despite drug habits and poverty. Junior misses his daughter Rina and, during his investigation, he meets abandoned women who make him feel guilty about the divorce from his wife Kathy, whose current relationship with a hunter named Bill gives Junior little mental flare-ups of homicidal rage. At the same time, it's impossible to imagine Junior living the crime-free life that Kathy wants because he's not only good at being a crook, he gets off on it too. I liked Hallinan's unusual protagonist, Junior. Being unconstrained by the law sure comes in handy for investigating crimes and dealing with criminals. I enjoyed Hallinan's riffs on the themes of love in its many guises, how the still waters of society and individuals run deep, the meaning of prejudice and the price of fame and survival. Hallinan obviously loves music and knows Los Angeles well enough to give us a criminal's-eye view of the city and its nearby desert. Sometimes I wondered if one of the two threads of Junior's investigations was about to get lost while he messed around, but that not only didn't happen, the suspense rose to a terrific finish. There are few better ways of spending a lazy evening than hanging out with resourceful Los Angeles burglar Junior Bender. Note: Thanks to Read Me Deadly reader Bonnie Riley, who pointed out this book to me. 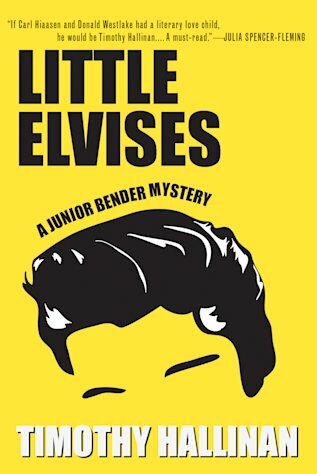 I received an advance review copy of Little Elvises, published earlier this year by Soho Press. Wow, you're welcome. You'll probably be happy to know that a new Junior is coming out in July, called The Fame Thief. I'm about half-way through it right now (courtesy of an ARC from Tim, full disclosure, as I update his website when he needs it). Bonnie, I'm glad there's a new Junior available in July. Thanks for letting us know.